Listen to "Maid: Hard Work, Low Pay, and a Mother's Will to Survive" on your iOS and Android device. Maid explores the underbelly of upper-middle class America and the reality of what it's like to be in service to them. 'I'd become a nameless ghost,' Stephanie writes about her relationship with her clients, many of whom do not know her from any other cleaner, but who she learns plenty about. As she begins to discover more about her clients' lives-their sadness and love, too-she begins to find hope in her own path. Her compassionate, unflinching writing as a journalist gives voice to the 'servant' worker, and those pursuing the American Dream from below the poverty line. 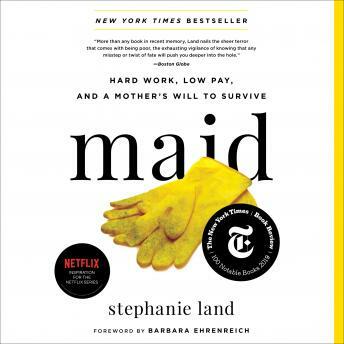 Maid is Stephanie's story, but it's not her alone. It is an inspiring testament to the strength, determination, and ultimate triumph of the human spirit. This was a pretty good listen. It kept my attention the whole time. I thoroughly enjoyed the narration of it. Not what I expected, even though I read the tagline. Although, being a housecleaner is part of her life, her struggles would have been the same in most occupations. Stephanie land is a talented writer with a strong voice. Im always suspect when an author reads his/her own work. But her voice is as compelling as her writing. No one else could have read it. Looking forward to more titles by this author.